Starting a new business like Not Ketchup is hard. Starting a new business like Not Ketchup when you're also running another business like The Kerekes Group is really hard. Starting a new business like Not Ketchup when you have another business to run and kids to feed and pay attention to and a husband to feed and pay attention to and laundry to fold and parties to throw and conferences to attend and meetings to lead and....well, you get the idea. To be clear, I am not complaining. At all. I love my new business, love my work, love my family, love my food blogging colleagues. Everything is going extremely well. I'm just busy and tired. Which is why I wasn't able to muster up anything fancy for the February meeting of Food Bloggers Los Angeles. The potluck theme was "Chocolate and Champagne." I made chili. Fortunately, my chili has a secret ingredient that kept me within the rules. 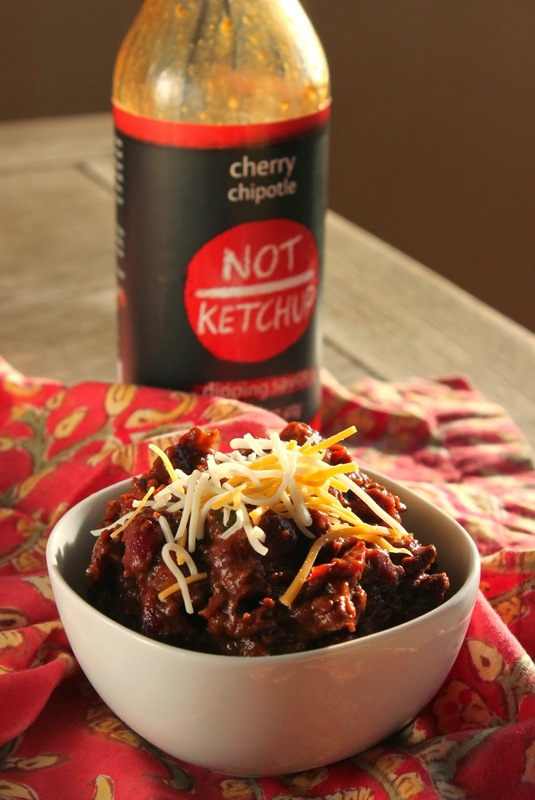 And here's a new discovery: A slug of Cherry Chipotle Not Ketchup did great things for this pot of chili. A little sweet, a little smoky, a little spicy, a little acid - it was just the thing. Highly recommend. A big pot of this slightly spicy chili makes any game day a special event. The two secret ingredients: cocoa powder and Cherry Chipotle Not Ketchup. In a large pot, brown the ground beef and ground turkey together over medium-high heat until no longer pink. Add the onions and red bell peppers and cook another 5 minutes until the vegetables are starting to wilt.Add the chili powder, cocoa powder, beans, tomatoes, salt, and Cherry Chipotle Not Ketchup to the pot. Bring to a simmer, turn the heat down to low, and cover the pot. Cook 1 hour, or up to 4 hours (the longer it cooks, the better the flavors will develop and meld - just keep checking to make sure it's not getting dry, and if it is, add some water). Serve hot, garnished with shredded cheese and green onions. Oh this was PLENTY fancy for me! I loved it (might admit to having 2 cups of it), the spicing was just perfect (not too hot, not too tame), and very complex flavor. LOVE! This chili was fabulous. Thanks for sharing with all of us at FBLA. That cherry chipotle did wonders to this chili! I like my chili (my secret ingredient is coffee), but I think I'll be tweaking it with more meat, cocoa and Not Ketchup after tasting yours!! It was the bomb! Ordering my sample pack to mow and I'll have to try this one. My wife is ordering it. Angela. And I wear 3x or 2xt shirt. Hint hint. @Anonymous I sent out your order today - so sorry, I am all out of t-shirts! I thought they would last through the week but then I had a FLOOD of orders after the ABC segments ran....in any case, thank you so much for your order and please let me know how you like Not Ketchup!